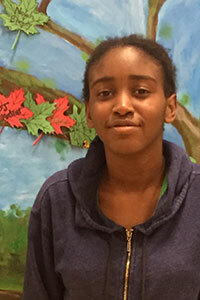 Naa Dedei Aryeetey, a seventh-grader at Warwick Valley Middle School, was the winner of the third annual “Stop Hate Orange County” essay contest, in the grades 7-9 category. Naa was presented with the award at a Holocaust Remembrance Day ceremony on April 25. The purpose of the contest is to promote tolerance and understanding through education. This year the contest focused on the issue of refugees by comparing the plight of Syrian refugees with that of Jews, just before the Holocaust of World War II. “Stop Hate” is sponsored by the Jewish Federation of Greater Orange County (JFGOC), the Newburgh Ministry, and the Orange County Human Rights Commission (OCRC). Naa’s essay will be published on the websites of the Jewish Federation and the Human Rights Commission.